We had one of those very odd weather days yesterday, when snow closed down my school (because of the elevation and bus routes) but not my sons’ schools. My wife was in DC, lobbying for the National Writing Project as part of the effort to restore federal funding. So, it was me and our dog for a few hours. I did chores and in-between, I wrote. Then, I saw that one of my NWP friends, April, had written a haiku at her blog site. I was reading it — it’s about a blind date — when I realized that a good comment might be a haiku, too. So I wrote one from the other side of the story of her haiku. and combs back his hair. I noticed another NWP friend, Andrea, had a poem, too. (She is part of a #poemaday twitter feed). Her poem was about kids and clothing and the metaphor of growing up and growing out of things. Again, I was struck by her poem and found myself writing a haiku response. And then, yet another NWP friend, Joel (starting to see a connection in my network of teacher-writers?) had a great poem about April Fools and the weather, which was on my mind, too, as I looked out our window to the trees dripping with snow. He referenced the groundhog in his poem, so I thought a way to comment w0uld be a poem from the groundhog’s viewpoint. Finally, I had my guitar out (dog at my feet) and was trying to work on a new song. This is what came out. I don’t necessarily feel it will go anywhere beyond this demo, but songwriting is poetry, right? I have been trying to write something about Japan — something true. But I have been failing miserably for days on it, to be honest. I can’t quite get the right song or emotion. So, this started out as a song about Japan, but veered sharply away at some point. Will you hold me together? Will you offer me shelter? if that’s what I need? I’m never more of a writer than in March, when the annual Slice of Life challenge rolls around with Two Writing Teachers. Every day (except I got started late this year because, eh, I forgot to get started), a bunch of teachers and writers zero in a small moment of their day and write about it. This is at least the third year I have been doing this with Ruth and Stacey, and so many others (some days, there were up to 80 links for slices), and I find the prospect of knowing I am going to be writing the next morning sharpens my attention on small things: a conversation, an observation, a new angle on a familiar idea. 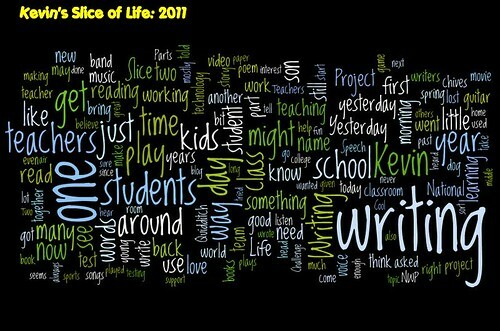 Up above, you can see the Wordle that I created from all of my posts this year. I guess it is no surprise that “writing” would loom large and that “students” is not far behind. I wrote a lot about my classroom, and that reflective stance is what writing as an educator is all about. That stance is also direct nod to the influence on my teaching from the National Writing Project, which taught me how to see myself as a writer. NWP folks showed me the way forward into using writing to think through what is working in my classroom and what is not, and if it is not, then what needs to change. The National Writing Project gave me space to develop these skills. During my month-long Summer Institute at the Western Massachusetts Writing Project, when we had long stretches of writing time, I felt as if I came into my own as a reflective writer, and I’ve never looked back. Sure, it helped finding an online home here on this blog, but even that was spurred on by my work with NWP, where my good friend and mentor Paul Oh showed us all about blogging in a summer when that term was still foreign to most of our ears, and most of the world (right before Howard Dean realized the power of the blog for political campaigning). We were among the first Summer Institutes to not only use blogging, but to reflect on its possibilities, which you see unfolding all around you: collaboration, authentic audience, peer feedback, etc. Blogging then connected me with others, such as the Two Writing Teachers community (which I found with help from another NWP friend, Bonnie). That, in turn, has helped me help others, with hosting of Day in a Sentence, and nurturing various online writing communities and projects (such as the Collaborative ABC Movie Project with Bonnie). NWP continues to lead us into the digital age with its amazing Digital Is site, where teachers are writing and reflecting on how technology is changing learning and teaching practices. Do you see how I connect the dots? Do you see how the National Writing Project was the start of so much of that push forward for me, as a teacher of writing and also as a teacher of technology? Don’t you wonder about those teachers who won’t get that chance now that the NWP has lost its federal funding? What collaborative and explorative projects WON’T now happen? It’s a bit self-centered, of course, but it frustrates me to think that the new wave of amazing young and veteran teachers with their own amazing ideas of teaching might not get the chance to inform me as a teacher if the NWP network is diminished. That person might even be you, and I want you to be part of us. I want you to help me become a better teacher. I know my connections with others won’t fall apart if NWP changes, but NWP is a lifeline for so many teachers and writers, and teacher-writers. It’s important. If you get the chance, drop an email to your representative or senator, urging support for NWP. Or if you blog about NWP, please add it to the hundreds of blog posts that are gathering at the Blog4NWP site. We’re shooting for a thousand posts by next week but still have a way to go. There’s room for your voice. That’s the NWP way. I saw this project and could not resist adding a line. It’s a Global Poem for Change Project by LitWorld, and they have started a poem with the help of poet Naomi Shihab Nye. The poem is open to the world to contribute a line, so that the poem slowly grows with each contributing poet. And the theme of peace and global change for the better is at the heart of the project. Go ahead — you come, too. The door is open for you for a single poetic line.